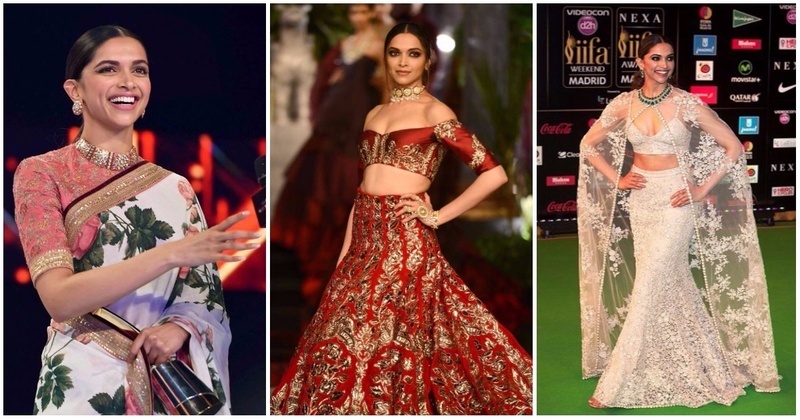 14 Ah-Mazing Deepika Padukone Blouse Designs To Steal For Your Own Lehenga or Saree! We all know that Deepika Padukone is queen when it comes to flaunting a saree. Her signature style being high-necks and sheer sarees, she nails every look perfectly. This pink Sabyasachi lehenga blouse with gold embellishment. We love this embroidered jacket-lehenga by Anamika Khanna. A super-plain blouse with a subtle floral net saree. Another Sabyasachi stunner, this white lehenga-gown with a plunging neckline. A cool black blouse with highlighted embellishment paired with a sheer saree. Love the unique style of the blouse - don’t miss the fringes at the hem! Another high-neck blouse with focussed embellishment and a sheer saree to compliment. DP’s signature style! White saree and high-neck blouse by Anamika Khanna. Cape saree blouse by Payal Singhal. Anju Modi’s colourful blouse with a white net saree. A slim strapped blouse with a deep tie-up back. A fully embellished blouse with net sleeves and of course, the sheer saree. High neck plain blouse with an red Benarsi saree from his 'The Sabyasachi Red' collection. In a silk round neck blouse with floral embroidery paired with a pale pink Sabyasachi brocade saree. So, which your favourite Deepika Padukone blouse design amongst all?